This artwork is available by custom email order only, payable by bank transfer. Buddha Shakyamuni sits on a jeweled throne, supported by snow lions representing fearlessness. He is surrounded by symbols of the Six Perfections — generosity, ethical discipline, patience, enthusiastic perseverance, meditative stability, and wisdom. His left hand is in the position of meditation and his right hand touches the ground symbolizing his victory over interferences to achieve Awakening. This is Leslie Rinchen-Wongmo’s largest and most intricate work to date, created in 1997 just after she completed her apprenticeship in Dharamsala. His Holiness the Dalai Lama expressed his appreciation for Rinchen-Wongmo’s work. “Very beautiful. 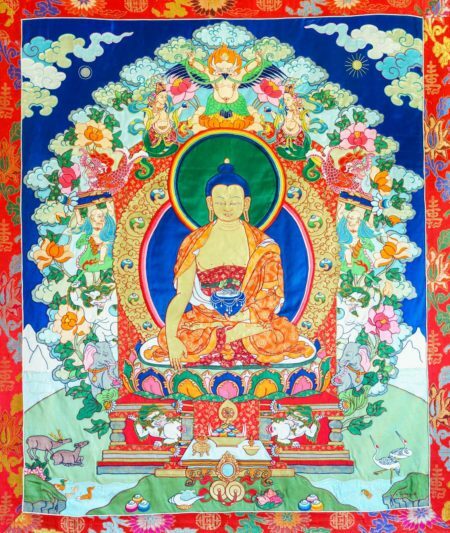 Very well done,” he uttered to himself as he gazed at this thangka. The thangka is completely hand sewn, constructed of pure silk satins and gold brocades hand woven in Varanasi, India. It is framed in a traditional brocade mount and rolls up like a scroll. Size: 78″ x 50″ (198 x 127 cm) including brocade mount. Contact us to reserve. We are taking email orders only for this item. Shipping for this original artwork will be calculated depending on the shipping destination and billed according to actual cost.